The 'subject' of a sentence is a concept that presents great challenges to linguists. Most languages have something which looks like a subject, but subjects differ across languages in their nature and properties, making them an interesting phenomenon for those seeking linguistic universals. This pioneering volume addresses 'subject' nature from a simultaneously formal and typological perspective. Dividing the subject into two distinct grammatical functions, it shows how the nature of these functions explains their respective properties, and argues that the split in properties shown in 'ergative' languages (whereby the subject of intransitive verbs is marked as an object) results from the functions being assigned to different elements of the clause. Drawing on data from a typologically wide variety of languages, including English, Hebrew, Tagalog, Inuit and Acehnese, it explains why, even in the case of very different languages, certain core properties can be found. 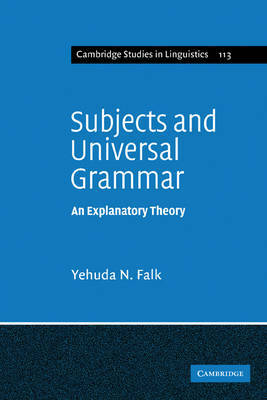 Buy Subjects and Universal Grammar by Yehuda N. Falk from Australia's Online Independent Bookstore, Boomerang Books. Yehuda N. Falk is Senior Lecturer in the Department of English, The Hebrew University of Jerusalem.